Varicose veins, although they tend to be unsightly looking, bulging veins, are no reason to feel self-conscious as more and more, thankfully, society has become open to diversity and is rightfully starting to see beauty in all different shapes, sizes and appearances. This is true of freckles and varicose veins as well. However, these veins are of concern from a health point of view and you should see treatment if you have the often-present symptoms of throbbing, pain, itching, swelling and leg fatigue. Spider veins are often as a result of overexertion of the legs due to standing or having to support excess weight. Varicose veins can also be due to hormonal changes, cortisone-based creams or medication, genetic factors or a lack of physical activity. Then there are blood blockages. These lead to too little oxidation, as not enough oxygen-carrying blood can make its way through. 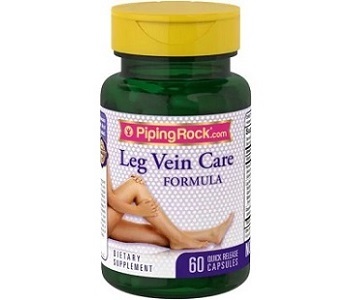 Leg Vein Care is a natural supplement made of herbs to support your legs and veins, and packaged in quick-release capsules. Today we review it as a potential aid for spider veins. The grape seed extract promotes healthy circulation, which is important so blood can flow more easily without causing the veins to bulge. It also of course eases heart stress. Butcher’s Broom is an astringent tonifier, so it really helps to tone the veins while making them more elastic and strong. It is often used in spider vein supplements. Horse Chestnut contains aescin, which helps to stop damage to capillary walls. Gotu Kola may assist healthy blood flow and reduce swelling, but this has not yet been established as hard science. Studies in animals show that bilberry positively affected blood flow; it also reduced vein swelling. Tale 2 tablets a day, preferably with a meal. Do not give to children, and do not take this if you are pregnant, breastfeeding, have liver disease or have kidney disease.. If you are taking any medication, planning any medical or surgical procedure or have any medical condition, consult your doctor first. If any adverse reactions occur, stop using this product and consult your doctor. You’ll pay $7.36 for one bottle of 60 capsules. At the time of writing this review, this represented a 25% discount on the normal price, which is $9.85. You may return the unused portion of your bottle within one year of purchase together with a short explanation to get your money back, minus shipping fees. We were surprised to find that we could not readily locate any consumer reviews for this product. The formula contains good traditional capillary vein ‘cleaners’ or tonifiers and astringents such as horse chestnut and butcher’s broom. They are aided by the grapeseed extract and bilberry in particular, which increase oxidation and blood flow/. The overall effect should be reduced swelling and pain. In our experience and from research, we’ve always found that while supplements such as these contain vital vein strengtheners and toners and allow for vital oxidative improvement, they do not go as far in treating varicose veins as using a dual-toning approach. The latter would consist of an internal and external remedy, such as a cream. If you if itching, for example, that is best relieved externally. In the same way that only taking a supplement does not go the distance, the same is true of only applying a cream. However, the price point of this supplement is good and it does seem to synthesize the major vein supplements, although it is not clear how effective in practise Leg Vein Care is turning out to be, due to a lack of consumers who have tried it and offered feedback. Progress to a dual-action remedy if this does not work, or if you’re after a complete treatment approach from the outset.